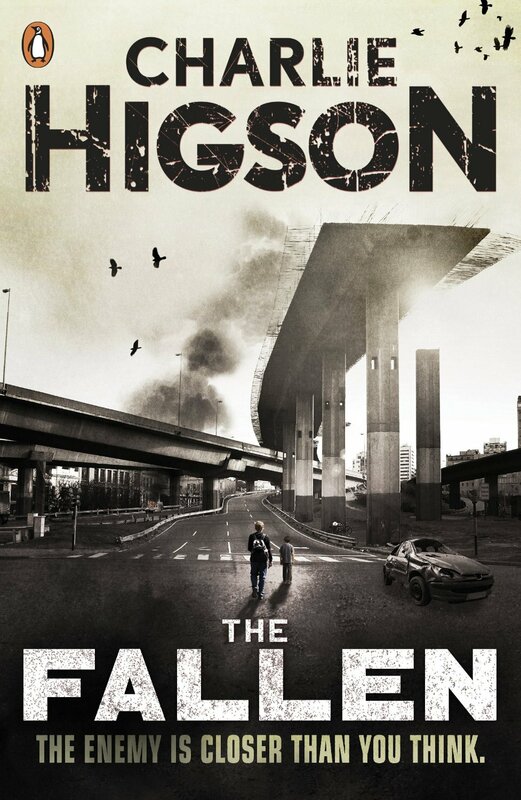 We are delighted to be a stop on Charlie Higson’s “Guide to London” blog tour to celebrate the release of The Fallen, the latest book in his YA zombie series. Thea was a fan of The Enemy and The Dead (books 1 and 2 in the series), so we’re very happy to host Charlie as he takes a zombirific tour of London – our stop is the Imperial War Museum. Please give a warm welcome to Charlie, folks! I wanted to set my ‘zombie’ series The Enemy, in as real and recognisable a world as I could. It’s about various gangs of kids scattered around different locations in London and I wanted to use locations that had meant a lot to me when I was a kid coming up to visit London. I wanted to include as many of the places I’d loved to visit. Between them these places cover most of central London and create a good geographical network. I knew these places well, but went back to them all to do research, walked around a lot, and, via Twitter, managed to get access to see some of the areas that are normally hidden from the public. I wanted to make it so that someone reading the books could retrace the footsteps of the characters and see the places exactly as described. The Imperial War Museum, south of the River Thames in Lambeth, was somewhere that, as a normal, red-blooded, boy, I always enjoyed visiting. I loved looking at the old uniforms and weapons, the re-creations of battles, and all the tanks and vehicles they had on display. I figured it was a good place for some of the kids in my books to go to hide out, because they could arm themselves very effectively from the weapons kept there (there’s even a secret vault in the basement filled with ammunition). In the story a group of kids come into London from the south, escaping from their boarding school, and they meet up with another group of kids who are living inside the Museum. These new kids are led by a scary, and autistic, military obsessive who calls himself general Jordan Horden. He’s odd, and hard to like, but he’s the sort of strong leader they need to get them out of the mess they’re in. The kids help each other out and help themselves to some weapons. So, to get the details right, when I was writing the second book in the series, The Dead, I visited the museum several times to photograph the exhibits and really get a good feel for the place. One of the fun things about the museum was that there was a recreation of a house during wartime, called The 1940s house. I thought it would be great for the kids in my book to sleep inside this ‘house within a house’. It would make them feel safe and remind them of cosier, safer times. There was also the recreation of a WWI trench and a recreation of wartime London during the blitz, including a bomb shelter and a cityscape of London in flames. I thought this would be a good location to set one of the key scenes in my book, as it’s quite spooky and weird. So I spent a lot of time making sure the details of the museum in the book were as accurate as possible. The only problem is that this year, 2014, is the hundredth anniversary of the First World War, and the Imperial War Museum felt that it would be a good opportunity to completely revamp, restructure and rebuild the interior of the museum and change all the exhibits. Damn! The new museum won’t be unveiled until July, but I’m not sure I can bear to go back there and see how they’ve changed it. Partly because I loved the old museum as it was, I’m a fan of dark and dusty corners, I prefer old-fashioned display cases to the brightly lit, all-singing, all-dancing audiovisual malarkey of many modern museums which seem to have no atmosphere. But I’m also upset because the new museum will bear no relation to the museum in my book. Any of my fans going there to see the place as described in The Dead will be sorely disappointed. That’s one of the perils of trying to make your book completely contemporary and realistic, events can very quickly move on and leave you looking so last year. I’ve tried to use a lot of very contemporary slang in my books, as well, so that modern teenagers in London would recognise the way the kids speak. The problem is that in five years time, maybe less, this slang may well seem out of date and old-fashioned. So what do you do? If you’re writing a series which is going to take you seven years to complete, will the way that the characters speak in the first book be out of date by the time you finish the last book? The other problem is that the timescale in my series, form beginning to end, is only really a couple of months, even though, as I say, it will take me seven years to write it. This poses the problem of when exactly the books are set? Are they set in the year that I wrote the first book, or the year in which I’ll finish the last book? Do they take place in 2008, or 2015, or somewhere in the near future? Are they an alternative present day? These kinds of questions can a send a writer mad. I think this is one of the reasons why fantasy books have a longer shelf life than ‘contemporary’ novels; they can’t ever go out of date. In the end, I just have to get on and write the books and try not to worry too much, or I’ll I have to go back and keep constantly updating them, possibly for the rest of my life. For instance, in The Enemy, written in 2007 (published in 2008) two young kids are discussing watching Lost on television. Well, a kid of that age now, in 2014, probably wouldn’t even have heard of Lost. Things move on. Particularly in London, which changes all the time. For instance, since I started writing these books a massive new skyscraper has been built on the south bank of the Thames near London Bridge. It’s called The Shard. It’s the tallest building in Britain and you cant avoid it. It’s not the greatest skyscraper in the world and is completely out of place there, as it’s sticking up all by itself, and skyscrapers always look best when they’re clustered together. 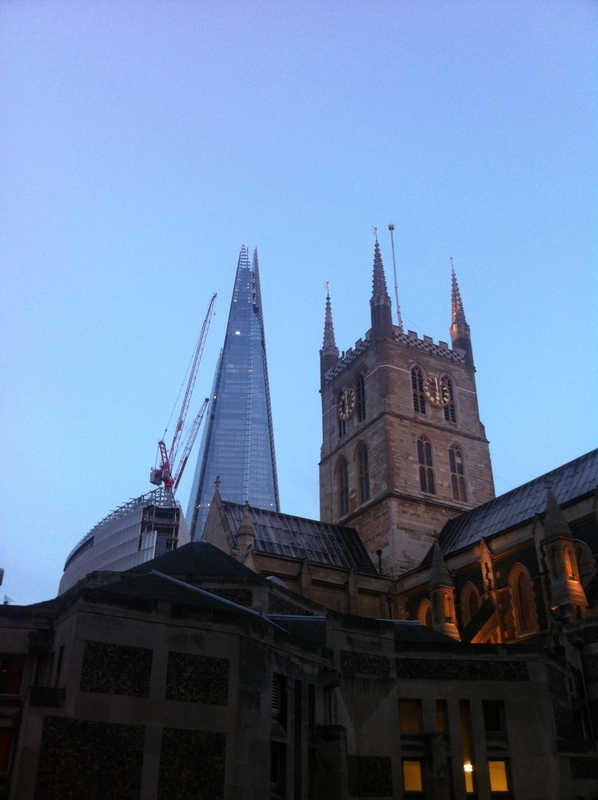 It also ruins one of the best views in London. Near where I live in north London, there’s a fantastic area of open land called Hampstead Heath. At the centre of the heath is a hill, Parliament Hill, which has amazing views out across London, and there, at the centre of the view, was always St Paul’s Cathedral, but now, directly behind the Cathedral and making it hard to see is the ridiculous, over-bearing Shard. As I say, it wasn’t there when I started writing my series, so there’s no mention of it. I’m always conscious of an internal battle when I write a new book – should I mention it now? As I say, it’s hard to ignore. It’s similar, though not as tragic, as what happened in New York when the World Trade Center was demolished. Suddenly the whole skyline, the whole iconic look of New York, changed, and movies fall into two distinct categories – those that were made while the towers were still there and those that were made after. I remember at the time the new Spiderman film was coming out and they’d filmed the climactic sequence on the World Trade Center. They had to completely reshoot it. World events move faster than us writers can keep up with. At the end of The Dead the kids are forced to leave the safe haven of the Imperial War Museum because a fire has started. I started this fire deliberately – there’s a lot of London, and perhaps I share a north Londoner’s prejudice against South London, but I didn’t want to get involved with writing about what was going on South of the river, so I burnt south London down. In the process, let’s say The Shard was burnt down as well, so that in my books it isn’t there, and the view from Parliament Hill is restored. As the chilling Enemy series continues to build toward its grand finale, the kids who have survived the diseased grown-ups grow more desperate for food, for a cure, for hope of any kind . . .
First the sickness rotted the adults’ minds. Then their bodies. Now they stalk the streets of London, hunting human flesh. The Holloway crew are survivors. They’ve fought their way across the city and made it to the Natural History Museum alive–just barely. But their fight will never end while the Enemy lives, unless there’s another way. . . . The kids at the museum are looking for a cure. All they need are medical supplies.To get them they must venture down unfamiliar streets, where it isn’t only crazed, hungry sickos who lurk in the shadows. In this fifth terrifying entry in Charlie Higson’s Enemy series, suddenly it’s not so clear who–or what–the enemy is. Charlie Higson is an acclaimed comedy writer, producer, actor, and genuine James Bond aficionado. He is the author of the adult thrillers Full Whack and King of the Ants; the internationally best-selling Young Bond series: SilverFin, Blood Fever, Double or Die, Hurricane Gold, and By Royal Command; and five books in the Enemy series. Charlie is a fan of zombie movies and believes that we shouldn’t try to prevent young people from experiencing fear, because it helps prepare them for later life. When writing The Enemy, he kept racheting up the action and description in an attempt to frighten the pants off his ten-year-old son. He lives in London. We’ve got one Enemy Prize Pack up for grabs! The sweepstakes is open to US addresses only and will run until Sunday June 22 at 12:01am (EST). To enter for a chance to win, use the form below! Good luck! Night of the Living Dead will always be my favorite. I happened to see it on a gloomy, foggy night (making it scarier) and have always loved the bleak ending. Dead Alive. Just a completely different source of the zombie virus. Fun film! The Newsflesh trilogy by Mira Grant! It’s aaaawesome 🙂 thanks for sharing! I love the Young James Bond audiobooks – I started listening in the car with my kids, but the little peeps were scared to tears the moment the math professor was killed with the knife through his eye. I was hooked, so I finished them by myself in the kitchen. Drove aimlessly some to hear more. I’m going to assume this series would freak the kiddos out too, but equally fascinate me. Glad to find it! And I completely understand about the real world changing around you and throwing your book off – my next novel has a scene (first kiss!) in the London Mail Rail’s abandoned tunnel, but then I read it’s going to open to the public as part of a postal museum. But at least not for a couple years! I’m going to go with Night of the Living Dead. Resident Evil is my pick! Forest of Hands and Teeth is the only zombie one I have read but looking to read more. I’m a huge Walking Dead fan, I’ve been reading the comic books online and it’s so much more suspenseful than the TV series. Night of the Living Dead is hands down one of my favorites as well. My favorite zombie story is Warm Bodies.